A visit to Bayfield on this beautiful summer day was full of fun surprises. Although my reason for going there was to participate in the Bicycle Opera ride and concert, I realized immediately something was amiss. I had arrived a day early. 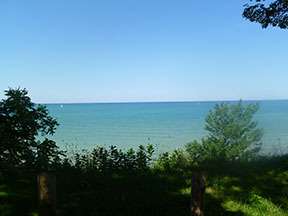 Never one to mind time in Bayfield, I set out on a quick ride around town and ended up at Pioneer Park where we had a wonderful view of Lake Huron. A storm the night before helped to break the humidity and extreme heat of the past few days so the breezes off the lake were fresh and welcome. Everyone we met commented on the beauty of the day. I had read Huron News Now’s report this week about a unique exhibit at Jonny’s Antiques. We decided to drop in for a visit and were delighted by what we found. 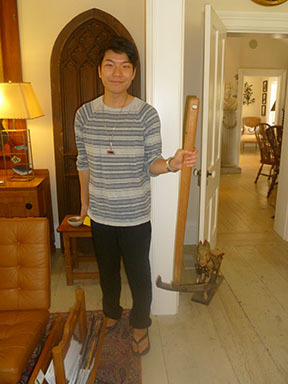 Our host, David, was quite passionate about the gallery, the collection and The Gordon House – home to Jonny’s Antiques. 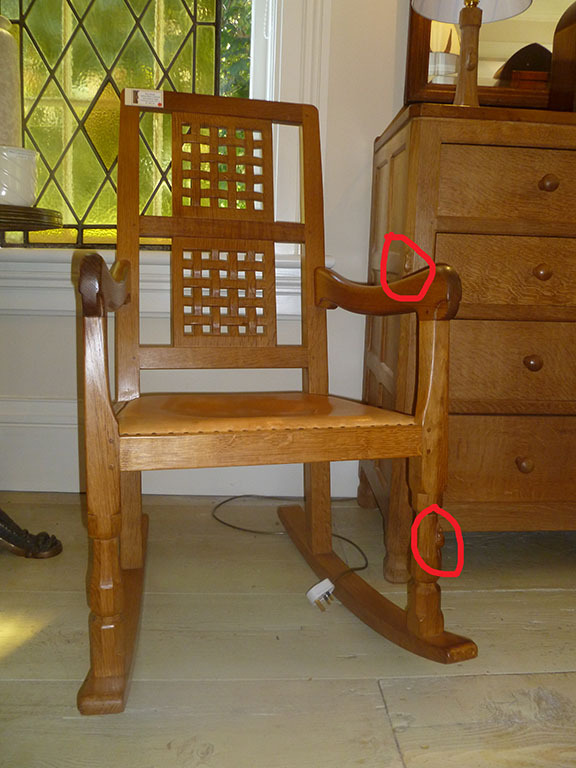 The collection we were looking for was furniture from a British artist Robert “Mouseman” Thompson. 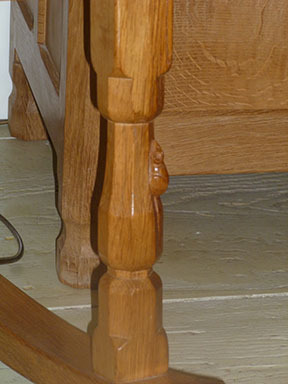 This beautiful oak furniture features Thompson’s trademark mouse on every piece – starting from the smallest napkin ring to tables and sideboards. . Thompson’s hand-made furniture is carved from naturally-seasoned English oak. David described how the materials would be dried outdoors, one year for each 1/2” of thickness. So a two-inch table would be aged 4 years. 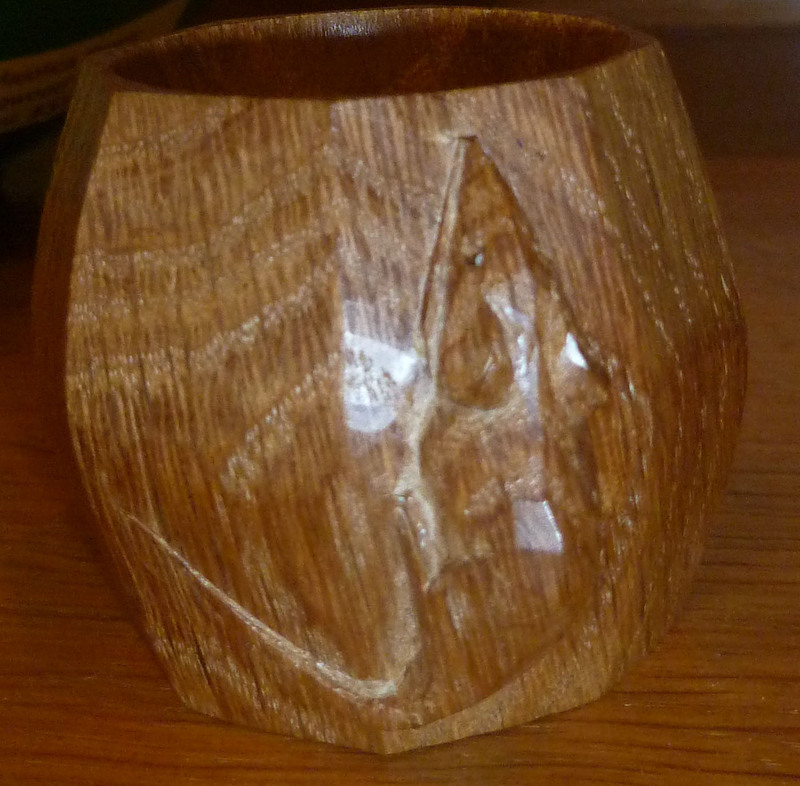 For this reason, the wood doesn’t crack during carving. “How do you tell if it is a genuine Mouseman item”, you ask? The trademarked mouse is very distinctive and always has carved whiskers, and no front legs. David holding an Adze … an ancient type of edge tool dating back to the stone age that are used for smoothing or carving wood in hand woodworking. Some of the furniture has a waved finish due to this tool. napkin ring, the smallest piece in the collection that includes a wide array of items. Research on the internet says Jonny Kalisch first opened Jonnys Antiques in a modest storefront property on Wellesley Street in Toronto in 1964. Several years later it moved to a permanent location in a Victorian home in Shakespeare where the popularity of Canadian antiques enabled the shop to expand into increasingly higher-end markets. By the early 1980s pieces were being brought in from around the world and Jonnys was becoming recognized as one of the few shops in Canada that regularly purchased from the world’s top auctions and real estate. As the business grew, new properties in Shakespeare were acquired until expansion into the international market required a return to Toronto in 1995 when a new location opened. This location opened up a variety of opportunities for Jonny including a rapid expansion into the Asian antique market. Successful expansions followed, including opening the contemporary gallery in The Gordon House in Bayfield in 2009. Part store, part museum, part residence Jonnys provides something one-of-a-kind. The charming Gordon House itself integrates modern design with past aesthetics. The house has been restored with much care and attention to detail. And an outdoor garden is beautifully fashioned to fit the home. 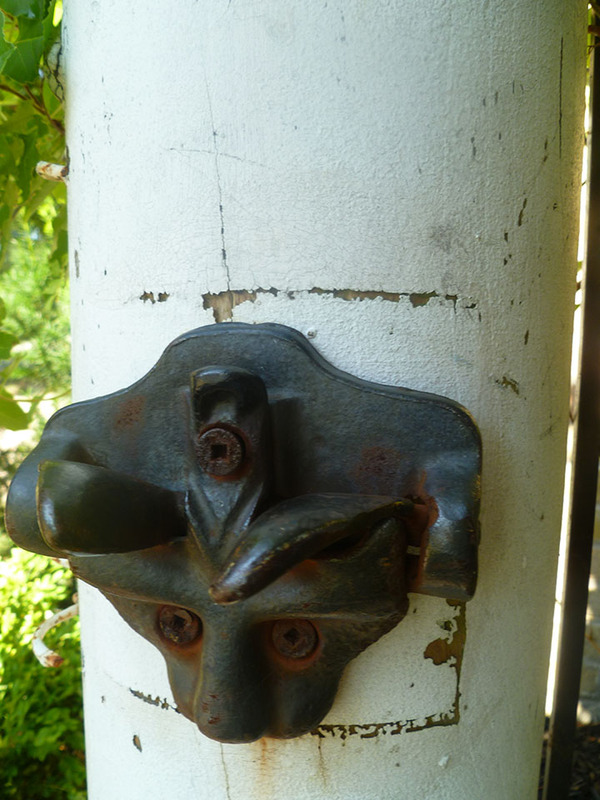 One interesting feature is the latch on the garden gate. Notice the cat in the photo? … the ears flop down to latch the gate.